For Feb. 1 of the 2019 Oregon high school basketball season, here's a look back at the Plays of the Day. To see complete game stories from all these contests, go to the Prep Basketball Tab. FOREST GROVE 59, SHERWOOD 48: With the score tied 36-36 in the wake of six straight Forest Grove points to start the fourth quarter, the Vikings' Dominic Funk drove to the basket and finished in traffic to give the Viks their first lead since the early part of the third quarter, a lead they would never relinquish in their Friday win. SOUTHRIDGE 43, JESUIT 24: Jesuit, getting a 3-point basket by senior Anna Fanelli to start the fourth quarter, cut the Southridge lead to 33-22 at that point. But the Skyhawks answered right away with a basket on a short-range bank shot by sophomore Kilyn Dawkins assisted by junior Cameron Brink that ignited a 10-0 Southridge run and put the game away in the Metro League girls basketball contest played Friday at Jesuit High School. 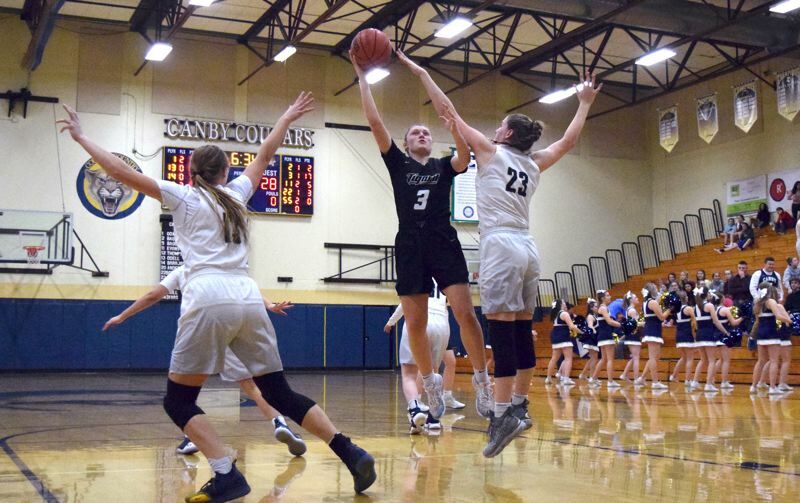 TIGARD 50, CANBY 39: Tigard's Campbell Gray scored seven straight points in the second quarter, including a three-point play, to shorten her team's deficit to just three at Canby High School on Friday night. Minutes later, Canby scored three points to keep its lead at 20-18, but Tigard continued to force the issue, using its press to force a number of turnovers and easy baskets in the paint. 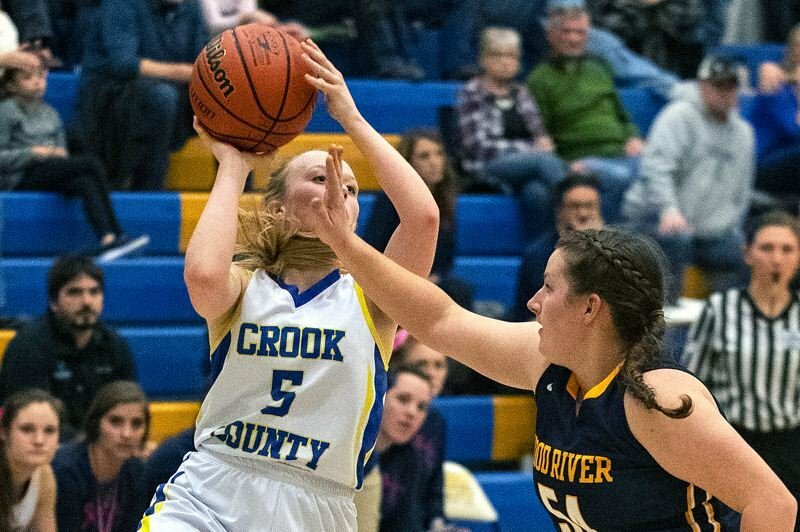 CROOK COUNTY 41, HOOD RIVER VALLEY 39: Clinging to a one-point lead with just over a minute to go, Teagan Freeman calmly brought the ball up the court, drove toward the basket, then pulled up for a 10-foot jumpshot. Freeman buried the shot and the Cowgirls hung on to win by a basket for their first Intermountain Conference victory of the year. JESUIT 52, SOUTHRIDGE 50: As the clock dwindled beneath the 10-second mark with the game tied at 50-50, Jesuit senior Justin Bieker took two dribbles to his right, pulled up from about 13 feet and buried the go-ahead jumper with three seconds remaining to give the Crusaders a 52-50 lead. 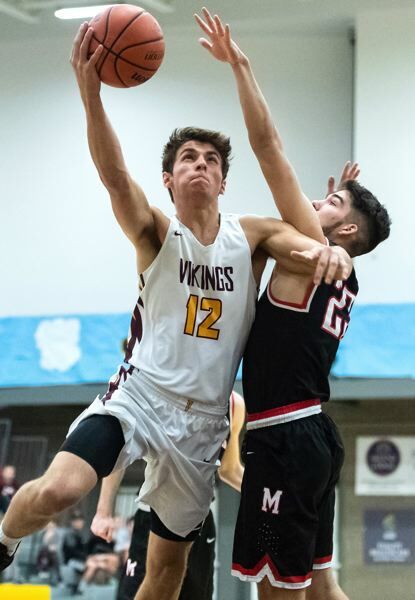 The southpaw's hoop held up, as Southridge's last-gasp halfcourt heave fell shy of the rim, giving Jesuit a commanding three-game lead in the Metro League standings. WEST LINN 55, LAKERIDGE 28: The West Linn boys basketball team edged away from Lakeridge in the third quarter of their Friday matchup at Lakeridge High School, then dropped the hammer on the Pacers in the fourth. And no one dropped the hammer harder than West Linn senior Oreon Courtney. Courtney, already the slam dunk champion at the Les Schwab Invitational, made a steal midway through the fourth quarter, roared downcourt and slammed home a one-handed dunk that boosted his team's lead to 47-24 and effectively ended the Pacers' day. WEST LINN 39, LAKERIDGE 38: It was just one free throw, but on Friday night, West Linn sophomore Peyton Shelstad's final point turned out to be the winning point on her team's thrilling 39-38 win at Lakeridge High School. Following a fast break basket by Lakeridge's Kiersten Weiler, Shelstad knocked down one free throw with 50 seconds left in the game, and when Pacer Brooke Clinton missed a 3-pointer just before the buzzer, it enabled the Lions to escape with the one-point victory.